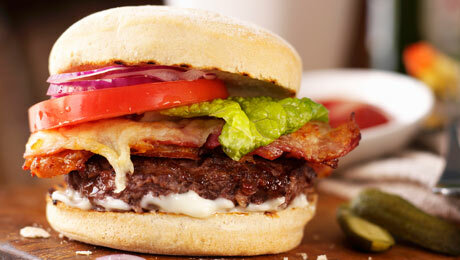 Fancy up an ordinary burger with Gubbeen cheese! Heat some olive oil in a pan and fry the beef burgers on a medium heat until fully cooked through. In a separate pan, sauté the onions in a little butter until soft and season to taste. Warm the burger buns under in a grill for one minute, just until warm. Before taking the beef burgers out of the pan, place a slice of Gubbeen cheese on top of the side facing out, allow to sit on the burger for 2-3 minutes until warm and slightly melted. Place the sautéed onion on the base of burger bun, followed by the beef burger and melted cheese. Add rocket leaves if desired.